I bought at least 3 items which I doubt were ever made as actual ear trumpets. Read Caveat Emptor - buyer beware ! As ear trumpets are becoming quite rare, collectibles marketed as ear trumpets fetch higher prices than they would if accurately described. Even some auction houses get it wrong ! Buyer beware ! I am NOT saying that any of these examples were intended to deceive - just be very careful to choose the items which seem to have reasonable provenance. Mostly, I believe that the seller is mis-informed. "Genuine ear trumpets have curved ear pieces so the end can go into your ear canal and yet the bell of the trumpet still faces forward." "Don't be fooled by the fact that you can hear through it"
Ancien cornet acoustique en laiton. Embout d'oreille en ébène (comportant une petite fente). Ebony ear tip (with a small slot). I believe that this is a marriage of a newly made earpiece (nicely done) and an over-cleaned piece of a musical instrument. There are no catalogue pictures of this shape. BUT there are examples of a similar shape in collections - it is all down to provenance. En bon état, usure d'utilisation. ANCIEN SONOTONE CORNET ACOUSTIQUE ACOUSTIC HORN HEARING AID EAR TRUMPET. Sad really, people are just horrible. THis looks as though it was built to deceive. Carefully documented earpiece is 14mm diam - must be for an elephant ! This device was completely made of bone for rich nobleman people who hear poorly. Since it is inconvenient to scream .Very rare. Without convincing provenance - just too iffy. Looks to me like it was built to deceive. Not rare - unique ! Looks like copper not brass. The 'earpiece' is broken off and could not be used in an ear. It is the wrong angle and very difficult to hold up to the ear. This looks great until you examine the 'earpiece' - it is clearly a tobacco pipe ! It has a mouthpiece ! It is probably a hunting horn in the English style. This device was completely made for rich nobleman people who hear poorly. Since it is inconvenient to scream . Made of brass.Very rare. To paraphrase this item was constructed from unrelated bits to sell to someone with too much money - noble or not ! Of course it is rare, it was made up from bits - and nearly $800 !!! We have had to lighten the photos - dark ones hide the telling detail. None of the mass produced conversation tubes had a straight 'earpiece'. This item is one of 5 listed by a seller, most of them appear suspect, but we would listen to good provenance. Antique ear trumpet device bakelite tested Rare. Shipped with USPS Priority Mail. This was probably not designed as an ear trumpet. This is a reproduction and offered in quantity. The seller openly declares that the item works but it is only intended for decorative puposes. You have to read the detail ! THIS IS A UNIQUE PIECE THAT IS 28 1/2in FULLY EXTENDED. IT IS 11in WHEN CLOSED. AND YES IT DOES WORK GREAT. IT IS LIKE TRIPLING THE VOLUME WHEN YOU PUT IT TO YOUR EAR. THE BOX ITSELF IS A GREAT PIECE. It is straight, with no earpiece. Marked HOWARD it clearly had a purpose but was not designed to be an ear trumpet. This Gentleman's Ear Trumpet/Horn really works and was fashioned from an antique brass car horn and a modern doctor's stethoscope. A buyer needs to really read the description and appreciate that this item (one of dozens offered over the las couple of years) is just a marriage of old bits and has virtually zero intrinsic value. It is a piece of whimsey, no more no less. Either strangely ignorant or hoping a buyer may be. Clearly another English hunting horn. From the photo looks like copper too ! Also from the photo it looks like copper not brass. A beautiful solid ear trumpet made from brass and inspired by a vintage design. As you can see in the photos, it is a high quality ornamental piece. Vintage design with an antique patina, recreated by hand. The dimensions are as follows: 27 x 6.5 x 2.5cm (W x H x D). This is an extremely impressive piece weighing 70g. The horn can also be used as a signalhorn or trumpet. 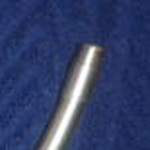 An internal removable mouthpiece is included as a fanfare for the contrary use. Blatant intent to deceive ! Ear trumpet is only included in the description to fool the unwary. The optional mouthpiece comment reinforces the seller's guilt. On top of that it is described as 'new' with patina added. Unbelievable ! Would work better as a funnel! 7 people actually bid ! VINTAGE - HEARING HORN - COPPER & BRASS. CONDITION: GOOD VINTAGE WORN,, ITS HAD A FEW DINK'S & A SMALL SPLIT IN THE SEAM. This seller unwittingly deceived people who have never seen an English hunting horn. Can there be that many ? Hi, ok thanks for the info. At last one honest vendor on EBay ! Seller reports that blowing in the 'earpiece' produces yes, 'some squeaky sound', but does not update the listing ! This ear trumpet is in original 'as found' condition and has not been repaired or restored. There are no chips or cracks to the dish or the drawer tubes, however, there is a small dent to the larger drawer tube. The ear trumpet has retained much of its original finish, however, it does have the scuffs and scratches you would expect from a well used item of this age. The tube slides in and out as it should and the rubber ear piece is still present. It measures 34 cm (18 inches) when extended and 21 cm (8 1/4 inches) when closed. I emailed the seller to point out that OL360 was introduced in 1948 and hence they might want to remove the 1890 assertion. We are unable to change the title as it has bids but we will inform the bidder and add a note to the listing for bidders to see. This German blowing horn was made bewteen 1891 and 1952. Probably not Victorian. It is clearly a blowing horn NOT an ear trumpet. Yes you are right! We've stopped putting it in our ears now and have blown a nice tune with it instead!! This is an unusual Bristol blue glass ear trumpet c.1870-80. The majority of these are made from metal but this one is made from Bristol blue glass. It has white wavy striations. It contains a metal ear piece. Good condition - two very minor chips on the rim (photos). No cracks. Diameter at the open end 3 7/8in (9.8 cm), length 8.75in (22.2 cm) and weight 0.32 kg. Oh no it isn't - look at the mouthpiece. Many thanks for your help with this - greatly appreciated. It contains what appears to be a metal mouth piece. It is a classic design for blowing. Usually they have a reed in the mouthpiece. I will now revise my listing. made of metal, 6 inches long. It has no earpiece and probably was not intended as an ear trumpet. The fact that it actually works is not provenance. Grand Dad used this, all time, got him hearing aids but he still used this, He was born in 1875 died in 1973 did not quite make 100 years old. Still works good Measures 17 1/2 inches, Time for me to get rid of stuff so here ya go. I thank you for looking and bidding. As you see in pictures Perko is stamped on Horn. The Horn was original to be a Horn off maybe a ship, Perko made a lot of Nautical brass and then was converted into an ear Horn Ie married and then used as such as stated above, very interesting Item. Very unusual Antique Georgian hearing aid ear horn. Or possibly a hunting horn. I believe it to be a hearing aid ear horn as the suspension loops one missing are far too thin to withstand being bounced around on a horse. The two bits of wood and metal plate where pushed inside the horn from the wider end as shown in last two photos, the two wooden pieces and metal plate were removed during cleaning and left out for identification purposes. The shape and existence of the metal plate between two wooden slips is a clear indication this was intended to be blown and make a noise. I have never seen a proper ear trumpet with two suspension loops - they are always noise making horns ! 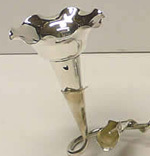 Collectors ignore straight ear trumpets because they are usually not ear trumpets. Would you want that thin end in your ear ? 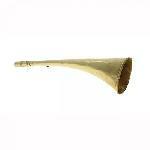 White painted metal ear trumpet, 19 1/2in long and 4 1/2in at the flared end. It has a brass band and wooden tip at the place it is held to the ear. This ear trumpet or ear horn dates from about 1870 and shows signs of wear and use. This is from my great uncle's farm in rural Pennsylvania. It probably belonged to someone in the family long ago. It is not a commercial trumpet. It appears to be a marriage of elements assembled by someone who does not know much about ear trumpets. made of brass, 10inch 1/2 long. This item is not a fake just a mis-representation. It is brand new and made by DekoEmpire. The item is listed on Ebay at $35. The item is further listed for auction on Ebay starting at $1. rare vintage ca.1930-40s German CHIRON OTOSKOP 99 Bakelite Otoscope ear trumpet speculum instrument set in velvet lined box. The seller can obviously read. The box is labelled Otoskop. 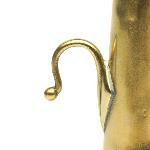 Rare Parisian French hearing aid device trumpet horn, 'Le Petit Parisien' graved in brass part, 31 inches long. This 3 piece marriage was sold a while back for $40 and is now offerred for $400. see fake #89. It is still a made up piece that was never an ear trumpet. The earpiece is untypical and the hose is an uncovered modern item. mit Holzabschluss. Nach alten Vorlagen neu hergestellt. und sollen den Antikcharakter verstärken. These are modern reproduction items. The horn is untypical and by an unknown trumpet maker. The tubing appears to be brand new. Perhaps the earpiece is too. We are pleased to offer this original antique baby/child's hearing aid primitive auricular device. Made of two parts which are made of bone and fine whole piece of brass long and thin tube that narrows gradually to less than 1 mm diameter opening. this end is a nice piece of bone to put in your mouth ! Well made and built for a purpose - just no idea what.Long conical section ends at a Brass joint - appear to fix onto something with a screw thread - may be a further pipe or hose as the inner is shaped to go inside and when screwed tight possibly air or water tight ? The seller has openly described the item as unknown. The words Ear Trumpet should never have been used. The earpiece and overall shape clearly define this is not a trumpet. Interesting antique terracotta or kind of plaster didgeridoo spiral, or made ear device, form of a shell or a snail, good condition, 7 inches long and pretty heavy. Who would ever manage to hold up such a heavy object ? Probably some sort of ocarina device made to make a noise - as the seller suggests a digeridoo ! But definitely not made as an ear trumpet. antique french made 1940 guaranteed. This is a FUNNEL ! The sharp end pointing the wrong way would hardly be comfortable in the ear. Just because it works doesn't make it a trumpet ! his Georgian silver gilt Ear trumpet was used by King George lV and was first sold at Osborne House after the death of Queen Victoria. Marshall Field and Co. had an antique silver collection of which this item was a part. Whether they acquired it directly as buyers from Osborne House I do not know. Ultimately it came to Zenith Radio Corp./Hearing Aid division in Chicago. This is a perfectly good Rein trumpet labelled 30 Charing Cross Rd.. Rein moved there in 1916. So I suspect that the provenance document applies to a different object ! Although I sent several emails to the seller pointing out the issue, the seller misquoted so that it appeared my surmise was inaccurate. Gotta be a misleading description ! It also has the earpiece missing. The item sold on 16 Apr. Look at the small end - patently an item to blow like a bugle or hunting horn. It would NOT fit in your ear ! 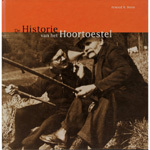 This book had a short print run but it is in the Dutch language. It is not in demand and has little rarity value. VERY NICE ANTIQUE BRASS OR COPPER EAR TRUMPET HEARING AID DEVICE, FINE DETAILS. At first this looked OK but I think it is another repro - we will soon know if it re-appears as a further offer !! $900 is probably a record ! The selling price suggests that someone was fooled ! A rare combination walking cane with ear trumpet handle. The trumpet grille is of gilt brass, it does not have a separate ear-pice, and no sign of one having been fitted. One photo shows a hole in the top of the ear trumpet. 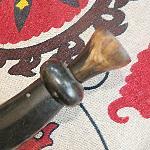 This was made to secure the trumpet to the cane (a large screw can be viewed through it). I am sure this hole would originally have been plugged with a small disc of horn. It looks like an ear trumpet but it never was ! To be fair they have described it correctly but the title is misleading. General wear and tear, including dirt all over. There are some internal flaws and bubbles and some small chips to the inside rims to top and bottom. This friggar was listed as an ear trumpet. I emailed the auctioneer and they kindly revised the description to that shown. So not a fake, a misunderstanding that was quickly updated. Vintage antique tin hearing aid ear trumpet or ear horn. Excellent condition as shown, 13 inch long, funnel opening is 3 1/2 inch diameter. No manufacturer or identifying marks can be found. Small end appears to be chrome, as it is not magnetic. This is not vintage it is a reproduction. The seller sold one of these a week back ! Antique Ram Horn Hearing Aid. Texas estate find. Actually works as a hearing aid, amplifies sound. Measures about 12 inches in length. This piece is right out of the old country and western movies. One of the buyers said it is actually a hunters horn so I am letting buyers know. I've only seen then=m used in old movies as hearing aids but maybe they served multiple purposes. Definitely not an ear trumpet but Ebay listed it as such because the seller used the words ear and trumpet. In fairness the seller was trying to be honest. being offered at as much as £305 too ! This auction is for an early ear trumpet measuring approximately 18inch. The ear trumpet is in great condition and made of tin. This one probably dates to the civil war or before. 67 Jul 2015 2***6 £13.85 k***7 Ipswich, Suffolk, Crested China, Florentine China. Rare Crest Leiston. Rare subject Ear Trumpet. Crested China. Florentine China. Rare Crest Leiston. Rare Subject Ear Trumpet. Marked on base....see photo....'Florentine China Made in England'. 9cm tall approx. Good condition. Edge gilding very slightly rubbed. Some people are honest ! Family says it was a hearing aid, was sold as a powder horn, and most call it a horn. Either way it is neat, cool and old. Maybe where the old tape is now there was a silver collar? Or 100% homemade? Not sure if the mouthpiece is sterling, when pulled out the silver is brighter and I see no base metal where it is worn, no markings on it. It is about 14in long overall. It is very effective to amplify sound. An antique brass ear trumpet/hearing aide. Measures 13 1/2 by 9 inches. It has a small ding, and a small crack (see photos). 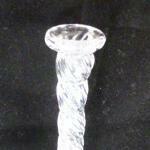 It is a glass trumpet. Made out of after-work leftover glass for sale by the blower and fashioned as a trumpet to blow. 59 March 2015 3***2 35 a***7 NSW Australia WW1 ANZAC.. TRENCH DEAFNESS .. HEARING TRUMPET. the earpiece is over 1 inch in dia, requires are very large ear ! 12 1/4 inches long (31cm). This is a vintage/antique ear trumpet/hearing horn/hearing aid. I believe it is made of brass. It came from the estate of a retired ENT (ear, nose and throat doctor) Otolaryngologist. It is marked PATD AUG.22, 05. It measures 14in high and the trumpet bell is 7in across. This item has a sharp earpiece that would be very uncomfortable and it is STRAIGHT ! Antique Brass Ear Hearing Trumpet French Depose . It is marked Amplicorn Depose as shown in the large pictures and measures 26.5 cm long and 9 cm diameter at widest point . Is missing the ear piece at end. Should polish up nicely. Selling a plated funnel as an ear trumpet commands a higher value - caveat emptor ! Seller agrees by email that it is a kitchen funnel but refuses to post the change of description. Another collector has tried to get the description modified too. A Bakelite end section of a hearing trumpet. 2in long and 2in diameter. According to its original re-established. and to enhance the antique character. but it is a bugle ! 50 Feb 2014 4***6 16 v***4 Lobbes, Belgium An acoustic horn is a tubular device or funnel which collects sound waves and the conduits to the ear. The result is a strengthening of loudness to the eardrum and thus better hearing for people who have a hearing impairment. An acoustic horn is a tubular device or funnel which collects sound waves and the conduits to the ear. The result is a strengthening of loudness to the eardrum and thus better hearing for people who have a hearing impairment. Funnel 4.5 cm x 6.5 cm. 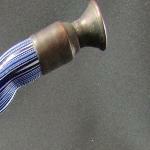 48 Feb 2014 3***5 E139 r***a Berlin, Germany 1820/80 rare ear trumpet / hearing pipe, sheet copper, handmade! 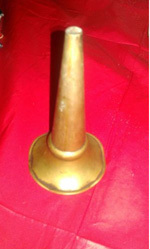 Rare ear trumpet made ​​of sheet copper. Made by hand. At the edge are smaller dents - see photo, otherwise a functional piece collection in altersentsprechendem, good condition. Amongst collectors it is accepted that ear trumpets are almost exclusively not straight. If this is was made as a trumpet then it is fairly unusual. Maybe it is home made and the source couldn't find a way to bend it. Nostalgia polished decorative brass ear trumpet. 16cm long. It is only offered as decorative but it is a horn to blow ! Funnel diameter 70mm. According to its original re-established. Antique-the mean bumps, minor damage, sometimes patina, irregularities on the solder seams and races are desired and to enhance the antique character. If you handle one it has a reed in the 'earpiece' when you blow it makes a sound! 45 Jan 2014 1***5 $15.99 a***7 West Bloomfield, Michigan Old/Vintage Hearing Aid Ear Horn Trumpet ??? Antique medical hearing aid tube - ear device, made of tin. Condition: used with traces from the age of time. Tall is 14,7cm (5 6/8''). It was made in 2013. It has no remblance to a traditional ear trumpet. The earpieces is too big to use ! HEAVY WALL ALUMINUM CLOSE END BOTTLE WITH EARPIECE OPENING. It looks to be a modified Le Blanc & Co Brass horn. It is @12in Long and the bell is 4 5/8in Diam. It has a thin brass finger loop soldered to the throat. and immediately closed the auction. The smaller end would never go in a person's ear! 33 Feb 2013 3***0 $85 l***6 Rotterdam, Netherlands antique MYSTERY ITEM HEARING AID DEVICE rare EAR TRUMPET?? A banjo style ear trumpet made of metal and showing signs of wear as you would expect from an item dating from early 1900's. Closed it measures about 19 cms open it is about 28 cms. The ear piece is black plastic, probably bakelite. it is a Medresco OL330 from 1952 ! Antique Ear Trumpet Hearing Aid From The 1800s. It measures approx. 8 in long, with a 3 in diameter opening rim to rim on the large copper flange. It is in good vintage condition with no broken areas in the horn or copper flange. The metal components show signs of age and wear with some minor dents and dings, as well as natural patina. The large flange appears to be held onto the horn with tiny nails. There is some wiggle or movement in the large flange, but it is still intact on the horn. The carry string is broken, but still attached to the horn. This string is VERY old, but whether or not it is the original string is unknown. the second image shows itis SOILD ! 2 gutta percha vintage ear trumpets. Small trumpet has a horn measurement of 1 3/4in and is about 6in long. Large trumpet has a horn opening about 2 1/4in and is about 5 3/4in long. No cracks or breaks. Both are missing the tubes for the ear. A 5 INCH LENGHT HEARING AID 19TH CENTURY. WONDERFUL COLOR PATINA AND WORKS WELL. REALLY PICKS UP THE SOUND ON THIS EAR TRUMPET. GREAT FOR THE MEDICAL COLLECTOS AND EARLY UNUSAL PRIMITIVES. This is a picture of a fake ear trumpet CONSTRUCTED FROM A vintage Brass Car Horn that I recently purchased on Ebay for less than $20.00. 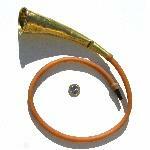 You can purchase from Ebay a Vintage Brass or NICKEL Car Horn and make your own Faux ear trumpets. 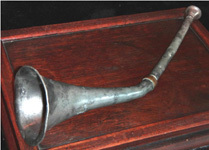 This FAKE ear trumpet is not an example of any type of early hearing aid historical development or so-called TECHNOLOGY but is an excellent example of a modified VINTAGE BRASS or NICKEL CAR HORN. If you are looking to purchase an original historical ear trumpet you should never consider purchasing anything that looks like the FAKE EAR TRUMPET you see pictured. Looks quite like the offer below ! 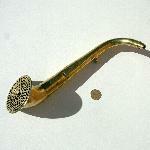 Item offered for auction is crafted from beautiful Vintage Brass and is Nickel Plated. Item stands appx. 8in tall and the decorative bell end measures appx. 3 in. Item is in very good condition, with minor blemishes and dings as one would expect from Vintage Brass-(please see pics). Please view pics to determine your own idea of condition. All solder joints intact and solid. The item pictured is the item you will receive. This hearing horn has been cleaned/polished to help return it to it's bygone lustre and shine. This is a non-working reproduction that gives you the look of the real thing at a fraction of the cost. This was likely made around the turn of the century based on the round wire (non-galvinized) nails used to secure the leather strap at the opening. Please realize that although this is probably 100 years old, this is NOT a true antique ear horn/ear trumpet, but a vintage reproduction. This DOES NOT work and is for decorative purposes only. Item offered for auction is crafted from beautiful Vintage Brass. Item stands appx. 12 1/2" tall and the bell end measures appx. 3 1/4 ". Item is in good condition, with minor blemishes and dings as one would expect from Vintage/Old Brass-(please see pics). Please view pics to determine your own idea of condition. All solder joints intact and solid. The item pictured is the item you will receive. This hearing horn has been cleaned/polished to help return it to it's bygone lustre and shine. This piece comes as shown, measuring about 15� inches length, no noticeable maker marks. Appears to be Silver, or silver plated, not tested, though clearly hand etched in antiquity. Amazing Piece! Another horn to BLOW ! And this is an Auction House listing ! 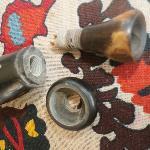 VINTAGE BAKELITE PHENOLIC ? EAR TRUMPET Marked No 6. Found in a draw and I sadly no nothing about the item. This clearly something to BLOW ! 16 Jun 2012 1***1 $269 c***1 Melbourne, FL, United States Ear Trumpet-Hearing Horn-Vintage- Nickel Plated Brass!! Item offered for auction is an Ear Trumpet. It is crafted from beautiful Nickel Plated Brass! Item stands appx. 7 " tall and the bell end measures appx. 2 3/8". Item is in very good condition, with some dings and blemishes as one would expect from Vintage Brass-(please see pics). This petite design enabled the user to be discreet. The item pictured is the item you will receive. This hearing horn has been cleaned/polished to help return it to it's bygone lustre and shine. Nickel plated ear trumpets are increasingly harder to find!!. This item is a wonderful example of 19th century technology!!!! Do not miss out on this fully functional, Unique, piece of art!! This Ear Trumpet will surely make a great addition to anyone's collection or a great "conversation piece". 15 Jun 2012 2***6 $98 a***s Historic Southern New Jersey, United States RARE Early ANTOINE COURTOIS Paris Medical, Brass EAR TRUMPET Hearing Device NR!! Now offered and estate fresh....is a very rare brass 19th Century EAR TRUMPET....it is stamped Antoine Courtois, brevete, Fracteur Du Conservatoire, Rue du Caire 21, PARIS also stamped is the name GUSTAVE 3..considered a medical device of the time and made by a formost brass musical instrument maker......this instrument measures appx 13 1/2 inch length.....wonderful original patina only achieved from age and use....has some dings and pings expected and some bend on the rim of the bell ( see pics )...exact age is unknown to us but we suspect it's fairly early because of what it is....please view all the photos as they serve as description also....ask all questions before bidding....NO RESERVE! A: Thanks for the interest and inquiry,,,this is a very rare item from this French maker of valve trumpets....I could not get a proper picture of the inside but it does have a vibrating reed which amplifies the sound that you can see when you look down into the end that you place against your ear..this appears to never have been apart and I do not wnat to disturb it...this is an extremely rare ear trumpet generally....but a most important piece from this maker....good luck ! Telescopic hearing aid by R.J.Dowling, London. The device is 12" long when collapsed, 17" long extended and is fashioned from copper with a gunmetal finish. The hearing aid is stamped with the makers name and also with a British War Department arrow so was probably military issue in WWI (or earlier?). Nice condition, the small dint in my last photo being the only significant blemish. 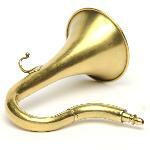 13 May 2012 1***6 $56.50 c***1 Melbourne, FL, United States Ear Trumpet-Hearing Horn-Vintage- Brass!! Item offered for auction is an Ear Trumpet. It is crafted from beautiful Vintage Brass! Item stands appx. 8 " tall and the bell end measures appx. 2 3/4". Item is in generally good condition, with some dings and blemishes as one would expect from Vintage Brass-(please see pics). This petite design enabled the user to be discreet. The item pictured is the item you will receive. This hearing horn has been cleaned/polished to help return it to it's bygone lustre and shine. From the bell end to the brass earpiece, this item is a wonderful example of 19th century technology!!!! Do not miss this fully functional, Unique, piece of art!! Age is unknown, but estimated to be late 19th century based on information received from owner's family. This beautiful piece is a perfect example of man's ingenuity. Before today's hearing aids, people would do whatever they could to increase the volume of what was around them, and the ear horn also known as an ear trumpet was born. Seems far more likely to me that this is a trumpet horn for BLOWING !! An uncommon object, a small tin/tole nicely crafted ear trumpet. It measures about 7 1/4" from tip to tip and is in very good condition, no breaks or bends, the solder tightly intact, the surface having the patination of over a century. It was found in WI and is assumed to have been made in the US, likely a unique object. Seems far more likely to me that this is a home modified funnel for pouring gas into the side facing gas/petrol filler pipe ! This is for an antique hearing trumpet. It is made of the black material that old phone receivers were made of. It measures about 5 inches long. There are two holes at the narrow end that I am assuming is for a place to attach a string or something else was attached. Oh no it isn't ! 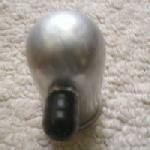 It is a mouthpiece from a 1930's telephone operators headset ! 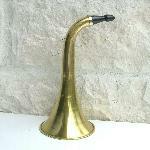 9 Apr 2012 1***2 $103.50 c***1 Melbourne, FL, United States Ear Trumpet-Hearing Horn-Vintage Brass!! 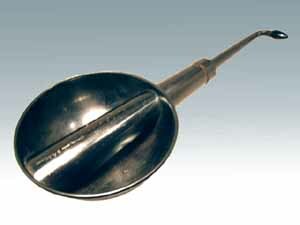 Item offered for auction is an Ear Trumpet. It is crafted from beautiful Vintage Brass! Item stands appx. 14" tall and the bell end measures appx. 6". Item is in good condition, with a few blemishes and dings as one would expect from Vintage Brass-(please see pics). It does a wonderful job of amplifying sound. The item pictured is the item you will receive. This hearing horn has been cleaned/polished to help return it to it's bygone lustre and shine. This fake does not even have pictures of the same item - in one shot it has a mouthpiece in the others it has been removed ! Another glass decorative horn with a mouth piece, described as an ear trumpet to get more dollars. Another horn with a mouth piece, described as an ear trumpet to get more dollars. 6 Feb 2012 1***3 $177.50 c***1 Melbourne, FL, United States Ear Trumpet-Hearing Horn-Vintage Brass!! This really a very cool piece!!! From the decorative bell end to the brass earpiece, this item is a wonderful example of 19th century technology!!!! It is about 10"L x 3.75" D at the mouth of the horn. It has a trumpet palyer in some sort of metal attatched to the side of it nicely. The metal pieces are on the ear piece and the bell of the horn are both dented and secured tightly with what looks to be aged bandage tape. Both metal pieces on top and bottom I think are tin, but I am unsure. It is not heavy. What makes you think that this is an ear trumpet rather than a horn for blowing like a hunting or warning horn ? This seller kindly responded to the criticsm of her description and CHANGED it for the better - there are some nice people !! TELESCOPIC EAR TRUMPET ANTIQUE HEARING AID MADE OF PEWTER ABOUT 12" LONG IN FAIR CONDITION FOR AGE. It is hand blown fluted/twisted glass curved into a trumpet. I believe it is a Georgian period ear trumpet (it does actually work). It stands 6." tall. Superb condition, no damage. 1 Feb 2012 1***7 $112.50 c***1 Melbourne, FL, United States Ear Trumpet-Hearing Horn-Vintage Brass!! Item offered for auction is an Ear Trumpet. It is crafted from beautiful Vintage Brass! Brass-(please see pics). The item pictured is the item you will receive. This hearing horn has been cleaned/polished to help return it to it's bygone lustre and shine. From the large bell end to the brass earpiece, this item is a wonderful example of 19th century technology!!! !